In my quest to understand the full potential of open and collaborative methods of working, I recently found myself re-reading “The Starfish and the Spider: The unstoppable power of leaderless organisations” by Ori Brafman and Rod Beckstrom. A spider has a CEO and a corporate headquarters, without which it cannot function. The examples in the book show why there’s a great deal at stake behind this contrast: issues of commercial revenues, the rise and fall of businesses, the operation of the Internet, and the rise and fall of change movements within society – where the change movements include such humdingers as Slave Emancipation, Female Equality, Animal Liberation, and Al Qaeda. There are many stories running through the book, chosen both from history and from contemporary events. The stories are frequently picked up again from chapter to chapter, with key additional insights being drawn out. I found some of the stories to be familiar, but others were not. 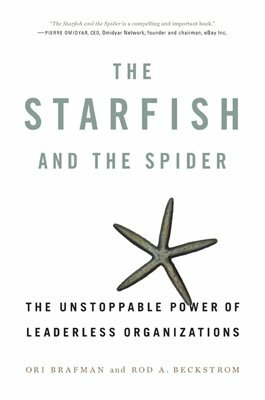 In all cases, the starfish/spider framework cast new light. Issues about combining aspects of both approaches. Regarding hybrid approaches: the book argues that smart de-centralisation moves by both GE and Toyota are responsible for significant commercial successes in these companies. EBay is another example of a hybrid. Managing an open source community surely also falls into this category. They make things happen, not by direct power, but by force of influence and inspiration.